The 52” K-6 excels with superb tone and touch that is sure to meet the demanding requirements of the professional pianist. 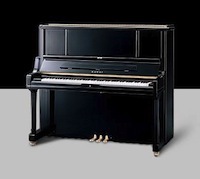 The exclusive Millennium III Upright Action provides exceptional control, power and speed to handle the rigors of advanced repertoire. With high-end features such as a duplex scale, agraffes and underfelted hammers, the K-6 offers a level of tonal quality and consistency that will delight the skilled player for years to come.